This important resource translates the popular Six Sigma methodologies, tools, and techniques in a way that is customized specifically for the design, implementation, and measurement of employee development programs. A proven alternative to the Kirkpatrick Model, this new model offers a more effective method for designing and testing the effectiveness of training. Define–What Are the Business Opportunities? Measure–What Business Targets Do We Need to Meet? Analyze–What Needs to Be Learned? Design–How Should We Teach It? Develop–Does Our Prototype Match Our Design? Implement–Did Implementation Meet Both Business and Instructional Requirements? "Finally! Something other than Kirkpatrick′s Four Level Model! Executives know and care about the power of Six Sigma, and Islam masterfully demonstrates how Six Sigma can be used in the design and evaluation of any training program which leads to the results that the C–level actually care about!" "This landmark book describes a proven process for solving the single, biggest problem training managers have? making sure their programs are fully aligned with the business. The Six Sigma process described by Kaliym Islam is an indispensable tool for program managers, training managers, directors, and CLOs." "Training departments are at risk if they don′t contribute to the bottom line. Developing and Measuring Training the Six Sigma Way shows how training can add value through business acumen, innovation, and leadership and brings instant credibility to training departments by applying Six Sigma methodology to decrease customer disappointment and increase customer success!" Foreword, by Edward A. Trolley. 1 Why ISD Has Difficulty Addressing Business Issues. 2 What Is Six Sigma? The History of Six Sigma. 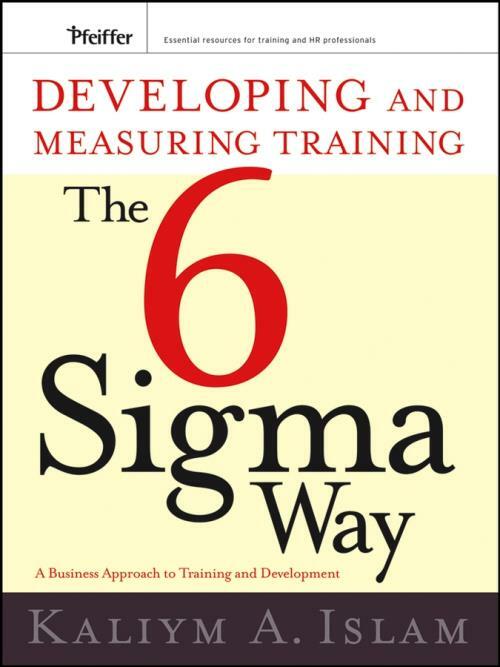 Six Sigma in the Training World. 3 Reasons for a Six Sigma Methodology. When ISD Is Used as a Development Methodology. Benefits of a Six Sigma Approach. Determining Which Six Sigma Model to Use. 5 Define: What Are the Business Requirements? Why a Separate Phase for Business Analysis? Define Step 1: Form a Business Review Team. Define Step 2: Develop and Validate the Project Charter. Define Step 3: Complete the Define Tollgate. 6 Measure: What Targets Do We Need to Meet? Measure Step 1: Identifying Business Requirements. Measure Step 2: Prioritizing Business Requirements. Measure Step 3: Translating Business Requirements into Measurable Targets. It s All in the Translation. Measure Step 4: Complete the Measure Tollgate. Measure Step 5: Transfer Requirements to the Development Team. 7 Analyze: What Needs to Be Learned? Analyze Step 1: Assembling a Design Team. Analyze Step 2: Identifying What Needs to Be Learned. Analyze Step 3: Validating and Prioritizing What Needs to Be Learned. Analyze Step 4: Complete the Analyze Tollgate. 8 Design: How Should We Teach It? Design Step 1: Identify the Learning Platform. Design Step 2: Convert Objectives into Learning Activities. Design Step 3: Create a Communication Tool. Design Step 4: Identify Development Resources. Design Step 5: Complete the Design Tollgate. 9 Develop: Does Our Prototype Match Our Design? Develop Step 1: Identifying the Factors. Develop Step 2: Developing Controls. Develop Step 3: Validating the Outputs of the Develop Phase. Develop Step 4: Complete the Develop Tollgate. 10 Implement: Did the Implementation Meet Business and Instructional Requirements? What Happens in the Implement Phase. Implement Step 1: Revisit the Project Requirements. Implement Step 2: Validate the Perspective of the Stakeholders. Implement Step 3: Gather and Analyze Project Data. Implement Step 4: Develop a Reporting Action Plan. Implement Step 5: Prepare Presentation and Update Storyboard. Implement Step 6: Complete the Implement Tollgate. 11 If Not Us, Who? If Not Now, When? PART THREE: A DMAIC CASE STUDY. 12 E–Learning the Six Sigma Way. What s Important? The Define Phase. How Are We Doing? The Measure Phase. What s Wrong? The Analyze Phase. What Do We Need to Do? The Improve Phase. How Do We Guarantee Performance? The Control Phase.